The thermometer shows more than 30 °C already. It’s ice cream season again. Therefore we made ice cream pancakes here. I’ve gathered some info on ice cream here. Here you can find the basic recipe for pancakes. Make pancakes as describe in the basic recipe. Fill one with a scoop of ice cream, roll it. Serve on a plate with ice cream on the side. Cook the rice in salted water. Clean the zucchini, dry it, remove stalk and grate it. Peel the potato and the carrots, grate them, too and add to the zucchini. Peel the garlic, chop it and add it. Mix flour with baking powder and add to the mix. Add cooked rice and egg(yolk)s. Chop the thyme and scatter over the mix. Add salt and pepper to taste. Knead everything. If the mass is too liquid add more oat flakes or flour. Form thick pancakes from the dough. Heat up oil in a nonstick coated pan and fry the pancakes. Turn the pancakes as soon as the edges appear brownish. Finish on medium heat. 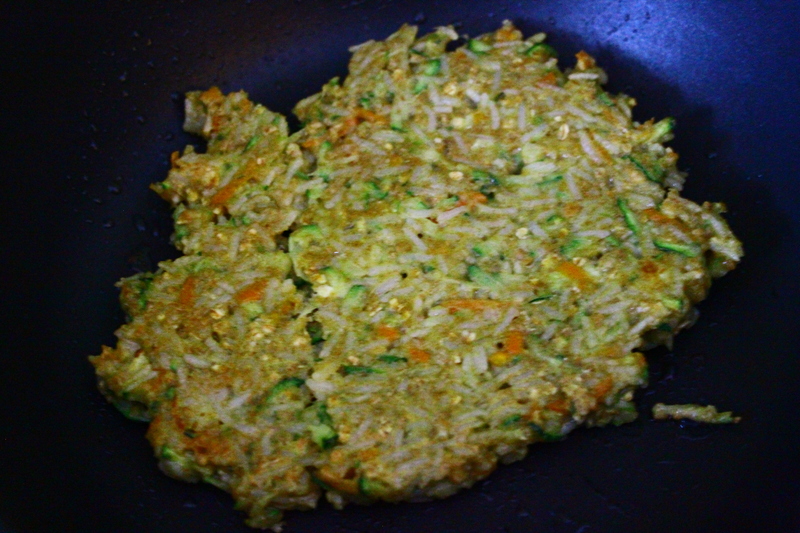 Cook the rice in salted water, clean zucchini, remove stalk and grate. Peel onion/shallots and chop. Add to the zucchini. Wrap in a kitchen towel and wring out the liquid. You can also use a salad spinner for this. Mix flour with baking powder and add to the onion-zucchini-mix. Add boiled rice, diced mozarella, oat flakes and egg (yolks). Chop the thyme and sprinkle over the dough. Add pepper and salt to taste. Knead everything. If the mass is too liquid add more oat flakes or flour. Great recipe if you don’t have so much fresh ingredients at home or when you want to get rid off some “leftovers” sitting in your fridge. 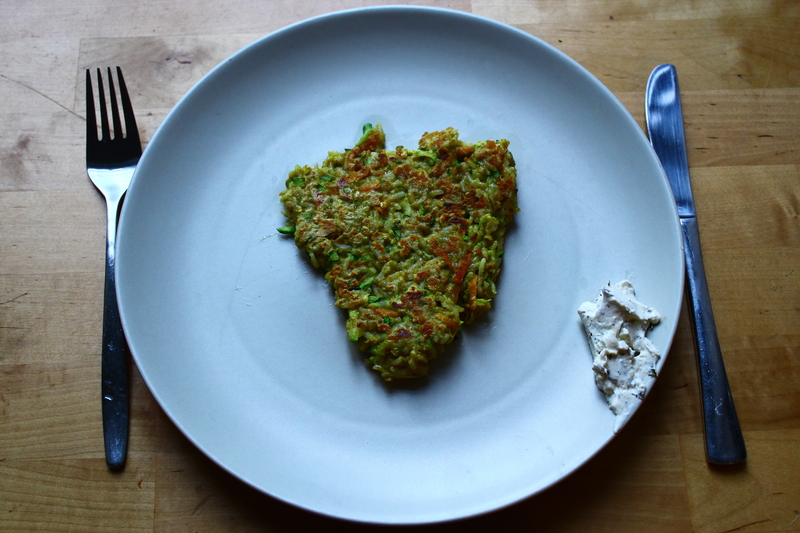 The pancake in the pictures also contains a grated carrot. Meaning, you can of course use your imagination and enhance the recipe as you wish. Peel carrots, clean zucchini. Grate carrots and zucchini. 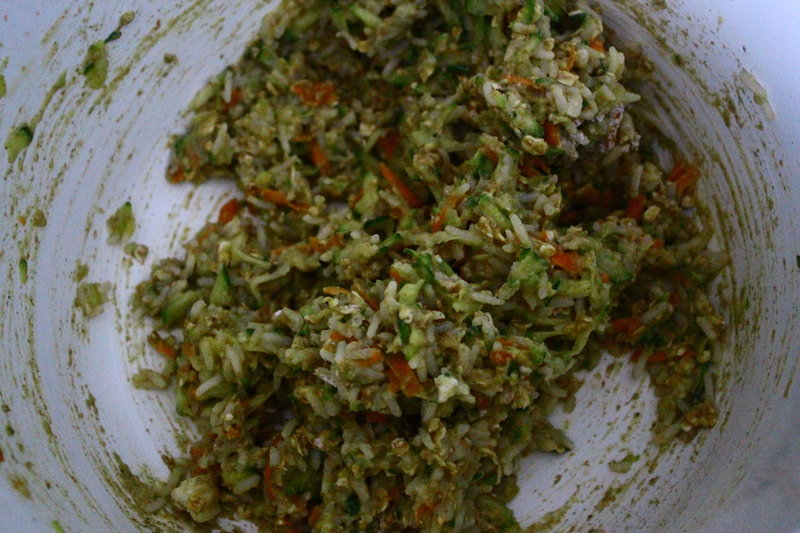 Mix grated carrots and zucchini with the other ingredients in a bowl to a dough. Heat up oil in a pan. Pour in the dough so that the bottom of the pan is covered. Fry from both sides until the pancakes appear in golden brown colour. Cream cheese makes a good topping for this.